I received some emails from some bento lovers who want to make a simple bento because they don't have much time to prepare bento for their kids, and said that they were not artistic enough to make kyaraben bento. So why not? Simple bento always works for me. Go for it. I made this quick and simple bento this morning. All I need just a small straw to make circles on my yellow egg sheet, flower cutter to make carrot flowers, and food picks to secure the carrot flowers so they didn't fall of. If making egg sheet is too troublesome, you can use nori and punchers to make some variations on the edge. Or you can use zig zag scissor that you get from your local craft store and cut the edge of the nori for onigiri wrapping. As simple as that, so don't be afraid in making bento. You can see that my early bento looks so awful but then I learn to make a better bento from bento friends and reading some bento books which help me a lot. In the end, only choose the style that suits you and you feel comfortable to work with. Everyone will have a different style in their bento making. This way, the bento making will be more fun and exciting. Inside the other round box : red paprika omelet, curry tofu, and braised pork minced meat with potatoes. I bought these new picks from Bento Craft online store and added them into my collections. And good news is that I will also GIVE AWAY these 3 sets of food picks for my lucky blog reader. All you need to do is to leave your name and email address in the comment box, tell me whether you prefer to make a simple bento or a kyaraben bento. I will draw for a lucky winner on Friday, 29 April 2010. The lucky winner for the giveaway is Cynthia (Comment No.1). The package will be sent out soon. Enjoy! Lia, this is so cute and do-able (except the egg sheet part, I am still struggling to make the perfect egg sheet ;)!) I LOVE those 2 cute food picks!! Instant cuteness, the flower cutter makes very pretty veggie flowers too. I only have one flower cutter, the other one is somehow gone missing :(. lovely idea to use the dessert pick on flower pedals. 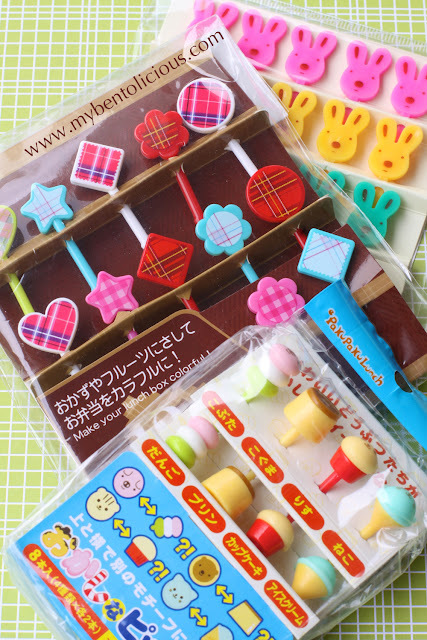 i would say i love both simple bento and charaben bento..
simple bento could cute too with the help of bento accessories. like the bento you made today. when I am in the mood, i will spend more time in making charaben bento. hai lia..! it's been a long time since my last bento and my last visit too to your blog. I've been absent in making bento for about two weeks. :D so glad to see the simple bento :) me myself, i prefer the simple one. like the ones that you saw on my blog. cause actually i'm not really good in making the kyaraben stuffs, though i still trying to make those sometimes :) but my first reason why i don't make the kyaraben and prefering the simple one (or let me say it as "non kyaraben") is because the bento i made, are not for children consume--but for my husband. he's not really "friendly" with kyaraben things, it'll cause him such a shame :D :) anyway, as usual, i always love your bento creation, they're so unique. Upps...And forgot to tell you: I love kyaraben bento more, even though simple ones can be cool too to make! This is so beautiful! You have a wonderful way of making simple bento look very fancy! I will follow your blog everyday just to see what new idea you have for your kids. The bento you made are great, inspire me to start making. So I'm till new in bent making, hope to learn more from you. So far I have only made simple bento for my husband & myself. I love love your blog! To be honest I have not made bento...but I have fallen in love with it! I'm still in the process of collecting supplies, books and ideas to prepare myself for when I start making it for my daughter! 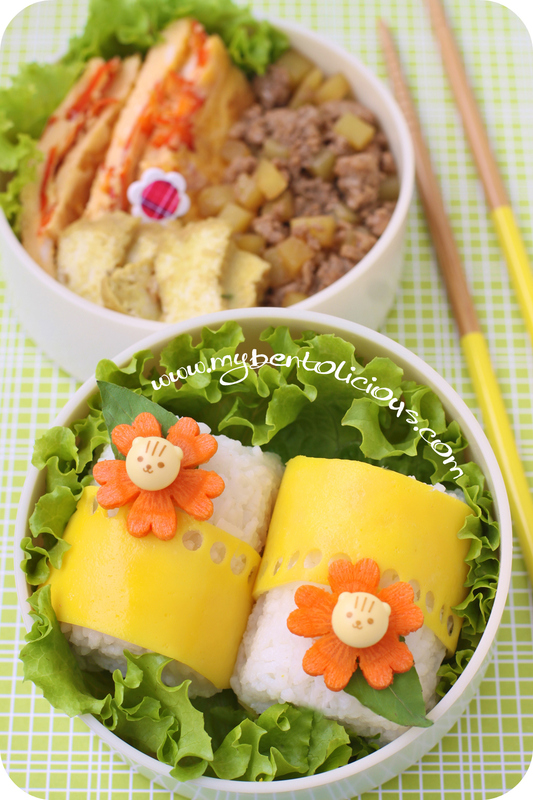 Even your simple bento always look so darn cute! Hi, I think you make the most neat bento, where it feels so complete. I also like how creative and artist your bentos are. I don't think i have the patience to create the fancy bentos that you make, mine are very simple, but i try to make it healthy. Thank you so much for your blog, i read it daily!!! It is fun for me. Thanks! Wow..simple but beautiful. I always love your charaben or non charaben bento. Kyaraben Bento is adorable. However, As I just start learning how to make bento thus I prefer the simple one. Love all your bento-making & wish you publish bento book someday. This is a really lovely bento! I love to see those simple but pretty bento, it reminds those of us who can't do such cute bento that it doesn't have to be Hello Kitty and what else all the time =). I have made maybe three or four charaben so far despite making bento almost every day ... So my answer is, I prefer simple bento ;). But I love cute picks, and so I would love to win these! i love to look at charaben that other people make, but haven't really done any myself. i mostly make simple bentos with some cut-out veggies and picks to dress it up. Your simple bento is great!!! mine is blech!!! ... still need to learn and push my self to me more creative. I really envy your talent. Hi Lia! Your "simple" bento is still an artistic and colorful vision infused with a delicate touch. As a lover of flowers and kitties, this ome feels like it was made just for me :D! Simple, complicated, kyaraben.. doesn't matter how you do it Lia, it always looks perfect! I like to look at kyaraben, but haven't been able to made one myself, so I prefer simple bento. Lia, it's so generous of you for another give away. Of course I prefer to make a simple bento lol! I would prefer kyaraben if I were better at it!! I'm so new so they take me a very long time! Planning on practicing during the summer school break when I'm not so pressed for time in the morning! i would make simple ones.....not skillful enough to make complicated ones. The egg sheet thingy is one that i can't still do it. The smoothness of your egg sheet makes me want to put on my face as egg mask. hahahaha......enjoyed your creations very much. Thanks for the tips you've given to me (for making egg sheet, I still try to make a smooth one). anyway, i used to make a simple bento, and i prefer to make kyaraben if I've enough time :D, and I will someday if my girl starts to enter her preschool. Makanya banyak baca blognya Lia ini :) Keren, saya suka sekali. I'm prefering simple bento, because I usually lack ideas how to do kyarabens, but when I get an idea I really enjoy making them! Omg, these are just stunning, sooo cute! You have such a cute blog, i just found it and it makes me really want to try bento more. This is simple but so neatly and nicely done! Love it! I tried to make bento but my 1st time making kind of fail as I forgot to include many things in. my 2nd bento making is better as I managed to know what i am doing best by bringing simplicity food and some beautiful toothpick and shapes cutting for the vege. wow... that turns out to be nice (I would not say too nice as I know I have plenty of room to improve on). Tks for all your guide.